Until the year 2010, there was a monopoly of Full-service Brokers in the stock market for providing their full-fledged services in India at some percentage charge. The problem with these Brokerage firms was that they chunk the major profits of the investors, thereby not leaving them with the most expected clear returns. For instance, if you have traded for a value of Rs 1 lakh, then you’d be required to pay as high as Rs500 for brokerage only. I think you will not agree to pay such a high amount for brokerage charges only. This is where the Discount brokerage concept was launched in India and then Zerodha came into existence first. You can say that Zerodha is the sole founder of this Discount brokerage concept. Today, there are more than 10,000 discount brokerage firms all over India with different pricing plans. The hot topic for our today’s discussion will be based on this Discount Brokerage firm. But let’s quickly revise what is Discount brokerage firm first. What is Discount Brokerage Firm? A discount Brokerage firm is that institution which provides you just smooth and transparent trading platforms and connection with the stock exchanges. The stock exchange includes NSE, BSE in common, and MCX and NCDEX in additional. The segments which can be traded over here include equities, derivatives, currencies, commodities, IPOs, MFs etc. The main thing about this house which differentiates it with the Full- service Brokerage firm is that it does not support advisory services to its customers. It does not provide them help regarding decision making on their investments. It provides very nominal and affordable rate services for every transaction cost and they are generally fixed by all firms for every segment trade. In the upcoming sections, I am, going to tell you the top 10 Discount brokerage houses and their details simultaneously. It will help you out in extracting the best suitable house for you as per your affording power and requirements. What is Demat Account and Its Charges? 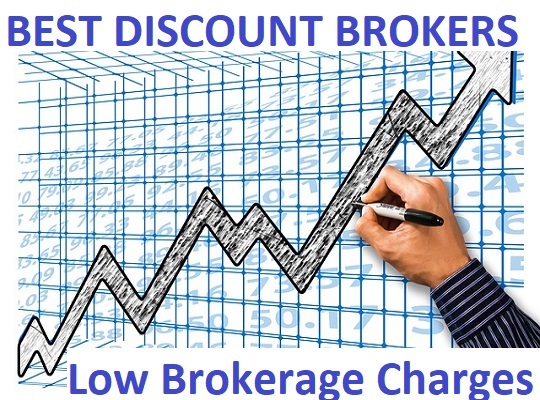 Let’s check out the best discount broker in India. This is the first discount-broking firm which brings the concept of discount brokers in India. It is the leading firm of all the discount brokers providing all-round services to its customers. It provides you the trading platforms to deal in equities, debts, currencies, derivatives, and commodities. The stock exchanges include NSE (National Stock Exchange), BSE (Bombay Stock Exchange), MCX, NCDEX, BTST, Mutual Funds, Forex Trading Spot etc. To execute all such trading activities on any platform, it charges a fixed amount and Rs20 is charged for a single trade. It doesn’t matter about the volume of trade and the profits or loss you have gained through trading. The most attractive feature about Zerodha is that if you are able to generate profit in 60 days from the day of trading, then all your trading cost for brokerage will be refunded to you completely. There are some trading platforms also availed by the Zerodha which includes the desktop software, or mobile applications. The names of platforms are Zerodha Trader, Zerodha Z5, Zerodha Mobile, Zerodha Pi. There are some education platforms also to educate you for trading, such as the Varsity and Open Trade. How to Make Money Through Stock Market? The Discount-broking firm 5Paisa is financed by the India Infoline Limited. It is a quickly growing company as it avails its services to such a large customer base at very low cost and that is why people love to deal with this brokerage firm. They charge only Rs10 for each executed order, which is really very low-cost service. And one more good news that it does not charge anything for the first 5 trades. They deal in equities, debts, IPOs, mutual funds, currencies, derivatives and commodities. The stock exchange to place such marketing includes NSE, BSE, MCX, and NCDEX. The opening services for the Demat and Trading account is also freely availed by the 5Paisa brokers. By depositing Rs25000 as an initial margin in the account, the client can get free of cost services for opening and maintain the accounts. The focus by Fyers is much given on the performances of trading platforms and that is why it offers the best trading platforms in the industry. It doesn’t charge any amount for opening the Demat and maintaining the account. It charges the brokerage at 0.01% or Rs100, whichever is lower. It also provides technical and fundamental tools for analysis on various topics to its clients so that they can track the performances. It allows trading in all segments except commodities, insurance, and IPOs. This is the new entrant in the market. It is known for trading first 50 trades for free at the platforms availed by it. After that, it charges Rs 20 for every trade in any of the segment. It provides high exposure or leverage, especially in intraday trades. Tradejini has its own Depository Participants and hence it provides an integrated platform for equity, F&O, commodities, and currencies. Whenever low-cost service is sought in the market, the first attendance is given by this leading firm i.e. Upstox brokerage firm. It is also known by the name RKSV. Like Zerodha, it charges Rs20 for every single trade, irrespective of the volume of trade and the return kinds (i.e. profit/loss). The equity-oriented securities are executed for free of cost. NSE, BSE, and MCX are the supported trading stock exchanges.No charges for opening the Demat account and AMC is asked here from the investor. Currently, it is offering zero brokerage for delivery trades. KSBL is a part of Karvy group providing a trading platform to its many users who have spread over 575 Indian cities, at NSE, BSE, MCX, and NCDEX. The segments which can be optimized include equities, derivatives, currencies, and commodities. It provides a single credential to its every customer to log in the Karvy portal and trade in multiple segments with the same ID. Karvy fall among the top 10 stockbrokers and top 3 depository participants in India. The customers can also invest in IPOs, mutual funds, and NCDs. It offers its own DP services. Daily, weekly and monthly technical reports can be acquired with the professional teams of this brokerage house. The NRIs can also use the services of this brokerage firm as it has the branches in Dubai and New York too. The customer services are also provided via e-mail, SMS, toll-free number and online support desk. Online chat via Skype and Whatsapp is also supported as a customer service. For delivery, intraday, and Futures & Options in equity trade, 0.03% are charged. Same is for commodities and Currency futures, while for currency options and equity options 0.50% is charged. Trade Plus is an Online Trading brand into which one can trade in equities, intraday, F&O derivatives, currencies, and commodities. It is a good distributor of mutual funds and IPOs. The trading platforms for trading these segments include NSE, BSE, MCX, and the NCDEX. Trade Plus online has been established in the year 2015, but the back-end supporter i.e. Navia, is in the market for a long time and has been serving as a financial provider. Trade plus online has its own DP services registered by the CDSL. The trading platforms in the form of mobile app, web and desktop application include- TradePlus Mobile, INFINI POWER, and NOW. For NRIs, INFINI MF is there, which allows them to invest in Systematic Investment Plan and lump sum. The transaction charges of Trade Plus Online is really very cheap as it charges 0.1% and 0.01% to trade in Equity Delivery and Intraday respectively. Monthly plans for trading in other segments are also quite cheap especially Rs 99 per month for trading in option, currency, and commodity each. Live Chat, e-mail, Phone calls are supported to handle the customer grievances. Bonanza is one among the old and gold companies, established in the year 1994. Within a short span of time, it is able to spread its branch in all over the nation with 1784 outlets in 560 cities. It offers its retail services in Portfolio management, wealth management, investment advisory, commodities trading, and broking via the internet. It was also awarded by the title as “Major Volume Driver” by the BSE. The trading platforms include Bonanza mobile, Bonanza Odin diet, and Bonanza Netnetlite. It is an online broker service provider to provide services on the segments like stocks, Futures and options, currencies, and commodities on the respective stock exchanges like NSE, BSE, and the MCX. SAS stands for South Asian Stocks Ltd. It has more than 6000 clients from more than 570 cities in India. The client can trade by using any of the platforms-either the NEST Trader or the NOW Trader. The charge for opening a new Demat account with SAS Online is Rs.200, which is to be paid initially. There is an annual maintenance charge for a Non-Individual account which amounts to Rs.500. It doesn’t offer the 3-in-1 account. A good thing about this brokerage firm is the SAS Online referral program, wherein, the customers can gain 20 to 50% of the brokerage paid by them by refereeing the SAS online to their friends and relatives. Rs 30 is charged for every failed or successive transaction. Trade Smart Online a discount brokerage firm backed by one of the traditional brokerage houses in India from 1994 and that is VNS Finance & Capital Services Ltd. It provides trading segments in equity, derivatives, currencies, and commodities. The stock exchanges supported by this brokerage house include NSE, BSE, MCX, and NCDEX. The house provides many useful articles written by well-knowledgeable experts guiding you how to use tools and analytics to generate reports and track the trade market. It has its own DP services, registered with the Central Depository Services India Ltd. (CDSL). The transaction cost to execute the trade is Rs 15 for every trade. You will not be charged for the month wherein you haven’t made any transaction. A call and trade feature is also available at the rate of Rs 20 per executed order. If you have any problem with the services then you can make use of the live chat facility also. That’s regarding the “Top leading discount brokerage firms” While selecting the brokerage house you should consider brokerage rates, comparison of charges among various brokerage houses, customer service, Own DP services in houses, software and mobile app and their ratings etc. Now, you have got access to the knowledge about the “Best discount broker in India” These above-listed firms are all doing very well in the market and they always try to keep their service cost at the minimum level because they do not avail the advisory services to you. Day by day, they are growing at exponential rates and one day they will surely catch with full-service brokers. If you have any doubt or suggestion related to this article then please write to us in the comment box. If you have an account in any of the above discount brokerage firm, then please tell us your experience with that firm and provide us the ratings also. It will really help the other readers and is also to analyze the firm’s performance. At last, don’t forget to like and subscribe us.